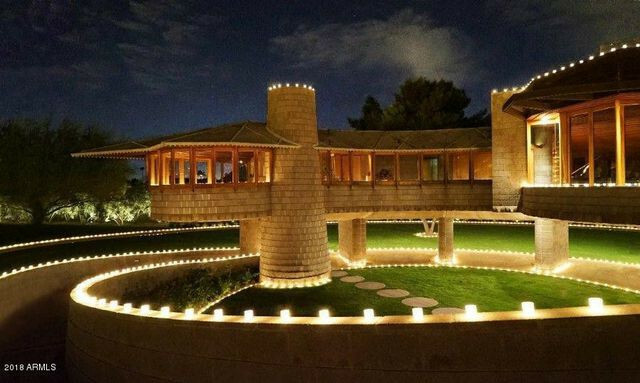 Frank Lloyd Wright fans are dizzy with excitement over the fact that a famous spiral-shaped house he designed in Phoenix has rolled its way onto the market for $12.95 million. Seriously, this place not only boasts this starchitect’s hands-on pedigree, but its winding shape was a prelude to Wright’s (and America’s) most famous spiral edifice of all: the Guggenheim Museum in New York. This home isn’t just any old FLW home, but one he designed for his son, David Wright, who lived there with his wife, Gladys, after its construction was completed in 1952. The 2,553-square-foot property features three bedrooms and four baths on 5.58 acres, offering sweeping views of Camelback Mountain. There’s also a 360-square-foot guesthouse. All of which sounds dreamy … but before you rustle up $13 million and head to Phoenix, there are a few things you should know about this house. Fine, it’s a one-of-a-kind beauty. 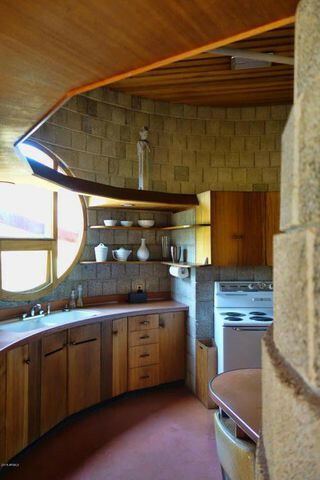 But have you ever considered what it might be like to actually live in a spiral house? First, let’s consider the upsides. Can’t do stairs? You’re in luck, this place offers elevation without the risks of falling down a flight and breaking a hip. It’s the very definition of wheelchair-accessible … and if you’re a kid, you can ride a skateboard from top to bottom, no sweat. But there are some very real downsides to this curvy design, too. Luckily, Wright not only designed homes, but also decorated and designed his spaces with custom and built-in furniture. For example, “This Phoenix home, like many of his residential properties, includes built-in sofa seating,” says Fastow. 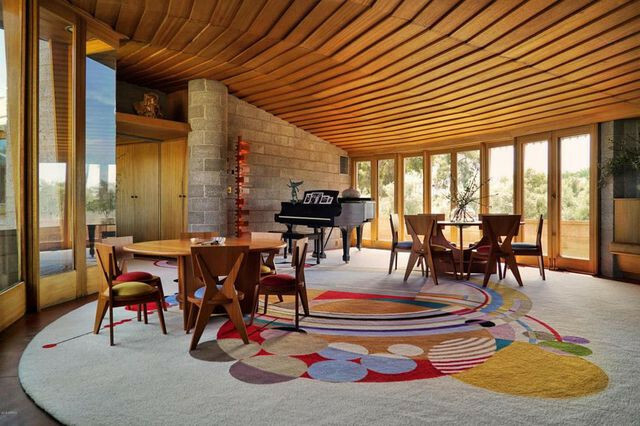 The listing says the home also comes with a dining table and chairs, as well as reproductions of Wright’s signature ”March Balloons” carpet in the living room. The living room comes with a reproduction of his “March Balloons” carpet. That’s great if you like this stuff … not so great if you don’t. In other words, if you’re the type who likes to completely own a space and decorate however you see fit, in this home you’d be butting heads and clashing wills with Wright’s almighty aesthetic. Good luck with that. Furthermore, brace yourself for a ton of visitors. As such, the seller might not have as easy a time unloading the property as one might think. “The potential downside of this home is that as beautiful as it is, it is truly unique, and these kinds of homes do not appeal to a wide audience of buyers,” agrees real estate agent Cara Ameer. “That being said, it is only takes one buyer—and people in this price point often want something that no one else has.” This place certainly fits that bill.